According to a study conducted by Fishburn Hedges and Echo Research, as many as 18 million UK Internet users have turned to social media at one time or another to connect with brands. It doesn’t come as a surprise that more and more people are taking to social media as a customer service outlet for a variety of reasons. It’s immediate, has the added bonus of public pressure, and you don’t have to listen to any annoying hold music in the process. 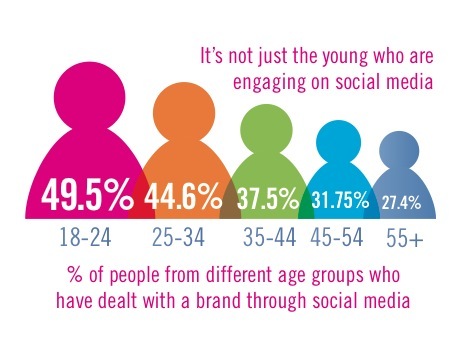 Polling around 2,000 customers, as well as interviewing executives at brands including PepsiCo, O2 and HSBC, among other brands, and monitoring social media use, Fishburn Hedges was able to come away with several interesting figures regarding the use of social media as a customer service tool. They found that the number of people who have interacted with companies and brands using social media has almost doubled in the past eight months in the UK. 36% are opting for the social media route today, as opposed to 19% just over half a year ago. 68% of the respondents stated that they have used social media to engage with brands, saying that “it has allowed them to find their voice”. Only 7% felt that social media wasn’t a suitable outlet for communicating with brands, a far cry from the 65% who felt that social media is a better method of communication than trying to get through to a person at a call centre. 40%, including those who have never actually used social media as a customer service tool, said that it “improves customer service”. This figure also happens to be six times larger than the 7% who say social media can have a detrimental effect on service. Speaking with senior executives in customer service, marketing and PR, Echo Research was able to come away with a list of guidelines that brands should bear in mind when considering how and when to use social media to connect with the customer. As more customers take to social media to voice their complaints, or compliments, more companies are taking extra steps to make that process a little bit easier. Comcast, for example, has a dedicated customer service Twitter account, ComcastCares, complete with the name and photo of the employee running the account. Giving it a more personable feel no doubt makes customers more likely to turn to the Twitter account, having put a face to the name, it’s a great reminder that there’s a ‘real person’ behind the account. Of course there are many brands are continuing to struggle with the social media beast. Conversocial’s recent study showed that some US brands take as long as 50 hours to respond to online queries, while 50% of the top US clothing retailers didn’t answer customer service compalints on Twitter. Want to visualize all of the statistics from the study, and get a more in-depth look at how to use social media to your advantage? Check out Fisburn Hedges’ report here (PDF).